Many celebrations in May and June call for something from the heart--engagement parties and wedding showers, commencements and first communions, rehearsal dinners and wedding breakfasts. A classic choice for such occasions, as simple to prepare as it is elegant to serve, is Coeur a la Creme, appropriate from breakfast at dawn to supper by moonlight. 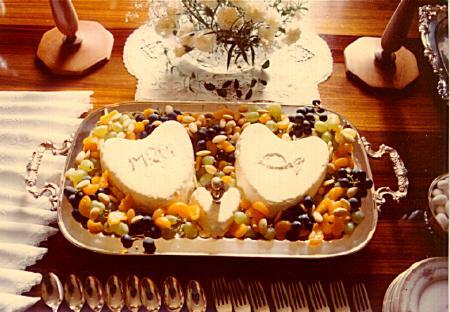 This trio of delicious cheese hearts--two sweet and one savory--require no cooking, can easily be made in multiples to serve a large gathering, and take only a few minutes of assembly at serving time. Tips: If you are making several hearts, you have to have a separate mold for each. You can use a disposable foil cake pan punched with holes at l-inch intervals for your mold. Check the capacity of your mold before you punch the holes, and adjust your recipe quantities (the recipes are each for a 3-cup mold). It is easiest to mix no more than enough for two hearts at a time. Also, make sure you have enough refrigerator space for all the molds plus a dish or pan for each to drain into. If you are transporting the hearts somewhere, leave them in their molds until just before they are served.